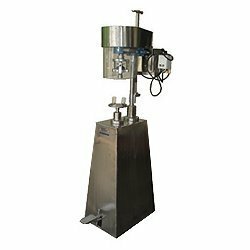 For the diverse requirements of our valued clients, we are engaged in offering an extensive array of P P Cap Sealing Machines that are ideal for application in pharmaceutical and liquor. The machines offered by us are manufactured from the innovative techniques & optimum quality of material in compliance with the set norms of industry. Our machines are highly praised among clients for its superior performance. We offer these machines in different specifications, designs as per the requirements of clients.